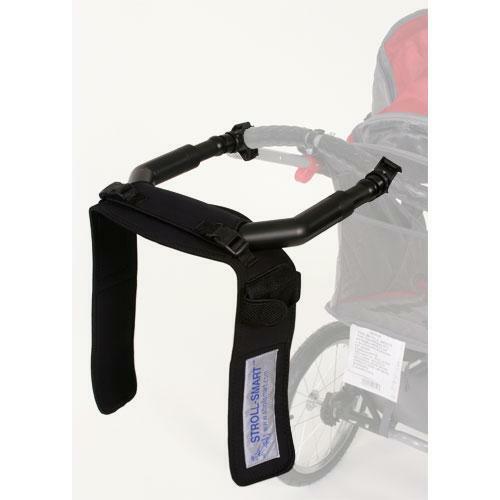 Size: Select; Medium to Large - 32" to 42"
Introducing the world's first recoiling hands free jogging stroller adaptor! Using lightweight, state of the art materials, the Stroll-Smart hands free jogging stroller adaptor offers security, safety, comfort and efficiency to parents who like to exercise without leaving the kids at home. The Stroll-Smart hands free jogger stroller adaptor was designed by Sarah Ray-Fay, an interior designer and active parent. Sarah loved taking her young son out in the jogger stroller but consistently found it uncomfortable not being able to swing her arms while jogging or walking. She would often push the jogging stroller with one hand, freeing up one arm to swing naturally. Sarah also noticed other parents with jogging strollers doing the same thing, sometimes even pushing the jogger stroller ahead and running to catch up! Sarah felt it was absolutely essential to design an hands free adaptor that would allow parents to fully enjoy the use of their jogger stroller. After 6 years of developing and testing prototypes Sarah is now introducing her revolutionary new product, Stroll-Smart. Stroll-Smart, currently patent pending, is a lightweight, hands-free adaptor that attaches to virtually any jogging stroller. 1) Flexible neoprene belt with phone, key or mp3 player pockets and highly reflective safety strip. 3) Stroll-Smart adapter handle bar with Neoprene belt. 3) Handlebar clips complete with hex key.